We are huge cereal eaters in this house, I even love eating it by the handful out of the box late at night as a dessert alternative. With that thought in mind, I knew I could come up with a great cereal dessert recipe. 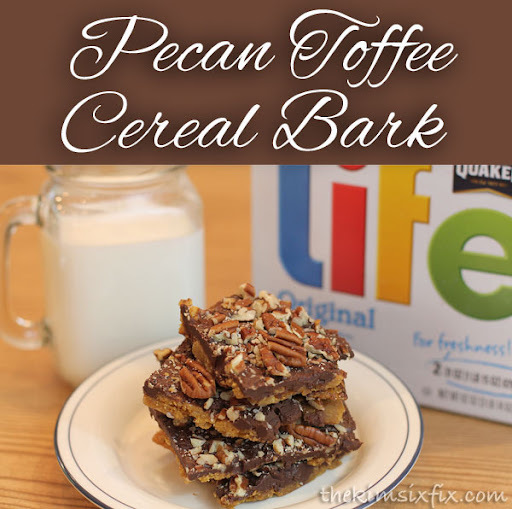 I love chocolate toffee bark, especially with pecans, and I knew the crispiness of Quaker® Life cereal would create the perfect base to absorb the sweet buttery crunch of the toffee. The recipe itself couldn’t be much easier. It only requires 5 ingredients: Butter, brown sugar, pecans, chocolate chips and of course.. Quaker® Life cereal. In a sauce pan, melt 1 cup butter and 1 cup (packed) brown sugar together. Heat to boiling, stirring occasionally and then allow to boil for 2 additional minutes without stirring. I tossed the cereal lightly in the caramel and spread it flat over the sheet pan. Remove from oven an sprinkle an entire bag of chocolate chips over the top. (You can use milk or semi-sweet chocolate depending on your sweetness preference). Allow the chips to sit on the hot cereal (or return it to the oven) for about 5 minutes, or until the chips soften enough to spread with a spatula. Spread the chocolate evenly and sprinkle with 3/4 cup chopped pecans (or almonds). I made sure to press the nuts into the chocolate so they wouldn’t’ fall off. A great way to enjoy your favorite breakfast treat for dessert!